Despite concerns voiced by the UK Food and Drink Federation (FDF) that the government’s current targets for sugar reduction are impossible to achieve, Swiss transnational food and drink company Nestlé earlier this month pledged to reduce the sugar content of their own products by 10% by the year 2018. 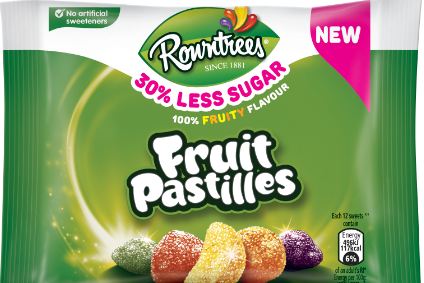 Now, we seem to be seeing some evidence of this commitment, as the company have just announced the launch of brand new low-sugar varieties of Rowntree’s products in the UK. The new products are part of their ‘Fruit Pastilles’ and ‘Randoms’ ranges, and contain 30% less sugar than their conventional counterparts. The existing lines will remain on sale alongside the low-sugar varieties. The company reportedly tested “more than 76 versions of the recipes” in order to create the new products, avoiding the use of artificial sweeteners to counteract the reduction in sugar.